Over the last couple of days I’ve been attending a performance coaching course in Bangor. After some initial trepidation (mostly created by the pre-course reading list that was sent) it turned out to be an interesting couple of days, surrounded by friends and acquaintances from the #BigIdeasWales project with whom I’ve worked for more than 11 years. We learned lots and had a chance to try out our new-found skills on each other. Thanks to Vicky from The Centre for Coaching for her tolerance and keeping us on track. We were kept sustained with handmade chocolates brought by Jo Edwards of Aballu plus constant chatter and anecdotes supplied by Andrea Calland from Hedge Witch Healing. 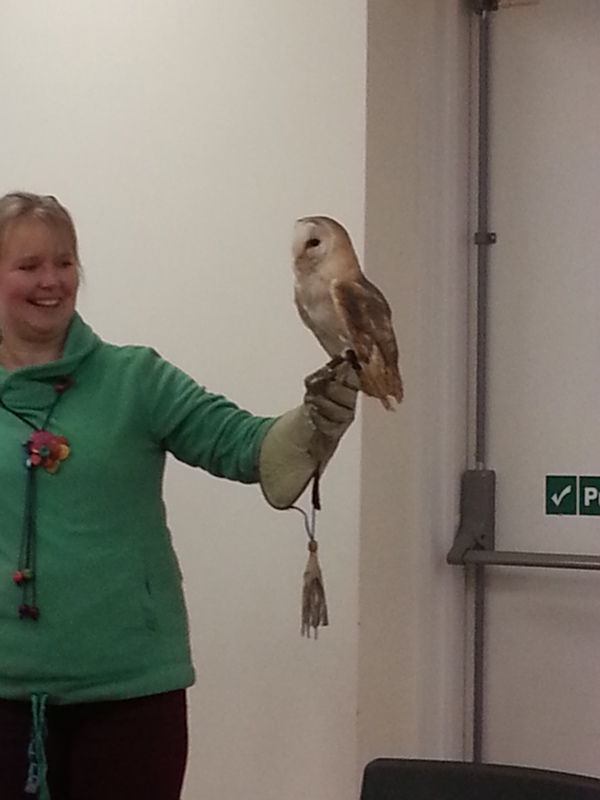 On the last afternoon Islwyn Jones from Pen y Bryn Falconry brought Willow, one of his barn owls, to fly in the meeting room. Lifted everybody for the last afternoon’s work. At the end of the session, David (Maria Garwell the Magician’s husband) produced a ball oon modelled apple for our teacher… maybe he was looking for extra marks in his assignment! Categories: General Comment, role-models, Training | Tags: #BigIdeasWales | Permalink.